Indigenous women were at the forefront of Seattle’s Women’s March on January 21, 2017. Photo by Micheal Rios, Tulalip News. If you’re an avid Instagram user, and let’s face it most of us are, chances are you’ve stumbled across somebody’s profile that is filled with gorgeous photos of mountain ranges, waterfalls, beaches and tall evergreens. Every day, more and more people are exploring the beautiful Pacific Northwest, hiking hidden trails in search of breathtaking views and secret camping grounds. A 2016 study, conducted by the Washington State Recreation and Conservation Office, reported that outdoor recreation generated over twenty billion dollars in this state alone. According to the U.S. Department of Commerce, outdoor recreation is a three-hundred-billion-dollar industry and is continuing to grow exponentially. And while it’s important to disconnect, inhale fresh air, enjoy scenery and experience the great outdoors, it’s equally important to remember that this land is sacred and has strong spiritual ties to the original caretakers of this region, who have lived off its resources since time immemorial. Let’s use the power of imagination to travel back about two-hundred years or so. You’re a young Coast Salish hunter who has been tasked to provide food for your family and village. After many years of cultural teachings, you’re finally ready to head into the woods to get your first elk. While you’re trekking up to the mountains, you recall all of the stories about elk roaming about in abundance in an area your family has hunted for generations. But you arrive only to see that there are hundreds of people hanging out, sleeping beneath the stars and enjoying themselves in a not-so-quiet manner. Because of all the people and constant foot traffic, there isn’t an elk in sight. So, you decide to try nearby areas to see if the elk have migrated, but instead you’re met with more people. Now you face the dilemma of providing another source of sustenance for your people, who depend on that meat for the upcoming winter months. Although crowded hunting grounds weren’t an issue two hundred years ago, you can see how big of an impact it would’ve had on tribal villages. When the Coast Salish people signed their treaty one hundred and sixty-four years ago, they kept the right to hunt and harvest on the same lands their ancestors had since the beginning of time. Fast forward to the summer of 2018. A story was released by a popular local radio broadcast, KUOW, with the headline reading, ‘Seattle Hikers: You may be trampling on tribal treaty rights.’ Within the article, Tulalip Natural Resources Fish and Wildlife Director, Jason Gobin, shared a similar story but in modern time, claiming that many outdoor adventurers are showing a total disregard to the tribe’s ancestral lands. He expressed that due to over congestion, the areas for tribal members to conduct their spiritual work, whether it be hunting, gathering cedar or harvesting huckleberries, has decreased substantially since the signing of the Point Elliot Treaty of 1855. The story spread like wildfire across Facebook and Twitter as people shared the link, voicing both their support and concern. Over the course of a few months, the article inspired several outdoor recreational organizations and non-profit conservation groups to reach out to the tribe in an effort to learn more about tribal sovereignty. 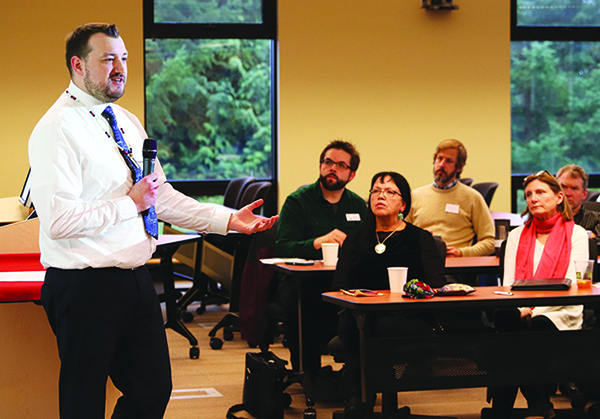 Because of the inquires, the Tulalip Natural Resources department hosted a daylong event for local non-governmental organizations to learn about treaty rights and the history of the Tulalip Tribes. On the morning of January 9, around thirty individuals from recreational and conservation groups gathered at the Hibulb Cultural Center to begin the day with a tour of the museum. While having fun with the interactive displays, the group gained a basic understanding of tribal lifeways. The group then journeyed across the reservation and made their way to the Tulalip Administration building. In conference room 162, Natural Resources’ Environmental Liaison, Ryan Miller, spoke passionately about protecting the treaty rights his ancestors fought to keep. Ryan Miller, Tulalip Tribes Natural Resources Environmental Liaison, speaks on the importance of treaty rights and the need to protect them. “Treaty rights are an inherent right,” he explained. “Treaty rights were not given to tribes, it’s a common misconception that the government gives Native Peoples special rights. That’s the exact opposite of how it works. Tribes are sovereign nations, they give up rights and they retain rights. Treaty rights are rights that are not given up by tribes and they’re upheld by the federal government as part of their trust relationship with the treaty tribes. The tribes right to self-govern is the supreme law of the land. It’s woven into the U.S. constitution as well as many legal decisions and legislative articles. The constitution says, congress has the power to make treaties with sovereign nations and that treaties are the supreme law of the land. Libby Nelson, Natural Resources Senior Environmental Policy Analyst, gave the group an in depth look at the Point Elliot Treaty. During her presentation, she familiarized the participants with the term, ‘usual and accustomed grounds’. She also touched on the Boldt Decision and spoke of the Tulalip’s current co-stewardship with the U.S. Forestry department, which dedicated an area solely for spiritual use such as berry picking and the annual mountain camp for tribal youth during the summertime. Natural Resources Special Projects Manager, Patti Gobin, shared a personal and moving story about her grandma, Celum Young, who was a first generation Tulalip boarding school student. As she shared her grandmother’s painful experiences, she quickly followed with a heartwarming story of Celum, depicting her as a woman full of love who struggled loving herself. Because of years of forced assimilation, Celum endured physical abuse for speaking her language and practicing her traditions while at the boarding school. And as a direct result from the boarding schools, Patti admitted that her grandmother never spoke Lushootseed or taught the language to her children and grandchildren, in fear that they would be punished just as she was. Patti Gobin, Tulalip Tribes Natural Resources Special Projects Manager, speaks passionately about the boarding school era and asks that attendees honor the tribal treaties. Native children who were around Celum’s age also experienced these atrocities at the boarding schools. Indigenous languages slowly began to slip away from their respective tribal communities. It wasn’t until recently that the language saw a major revitalization within the Tulalip community. Patti shared all this information, weaving together tales of happiness during dark times, to paint a picture that showcases how the trauma from the boarding schools trickled down generation after generation. Patti then asked the group to help honor tribal treaties, now that they are equipped with more knowledge and understanding of treaty rights and the tribal experience. She suggested signage depicting the tribe’s history as well as murals, such as the ones that will be displayed shortly in Skykomish and the San Juan Islands. 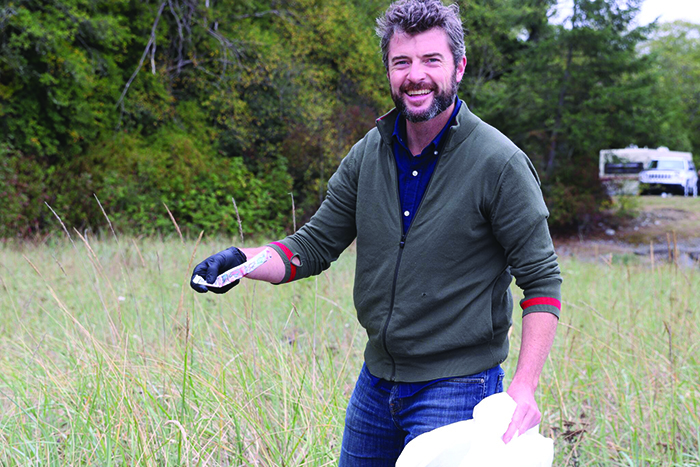 At the end of the presentations, Ryan handed out a list of principals to the recreationalists and conservationists, stating that the tribe wants to be included in any project proposals and to build strong relationships with each organization. He urged them to bring the principals back to their team and discuss and modify the list to meet their mission and values. 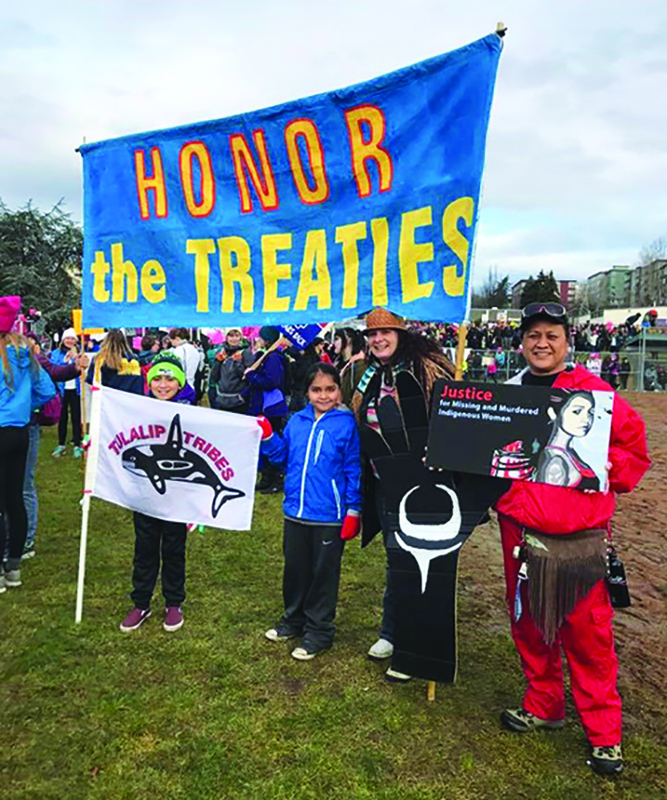 The Tulalip Natural Resources Department plans on hosting several more Treaty Rights events like this throughout the year, tailoring their presentations to groups such as environmentalists and governmental entities. For more information, please contact Natural Resources at (360) 716-4480. Thirty years ago, you couldn’t find a map using the term “Salish Sea” for the Puget Sound region. 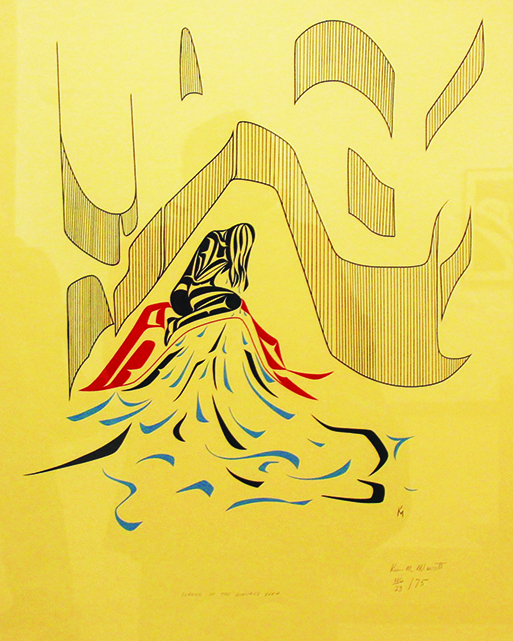 There were Seattle galleries and souvenir shops aplenty selling Native art, but the masks, totem poles and sinuous formline animal prints were designs from hundreds of miles away, not from here. Thirty years ago, no major art museum in Washington had mounted an exhibit highlighting Native created works of our own lands and waters. 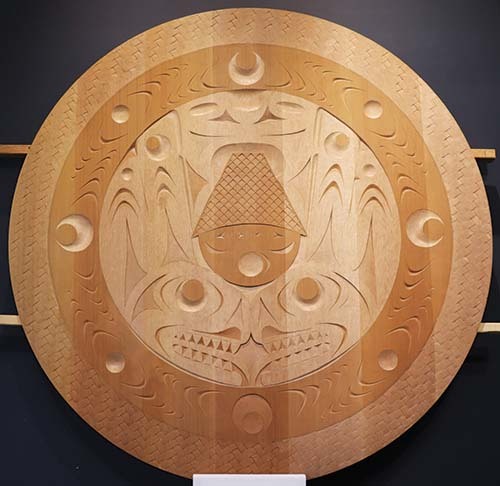 Salish artists were indeed honing their skills and creating beautiful works of art, but the critical interest and most gallery attention was focused on art from Alaska and the Canadian coast. In 1989, the balance started to tip. 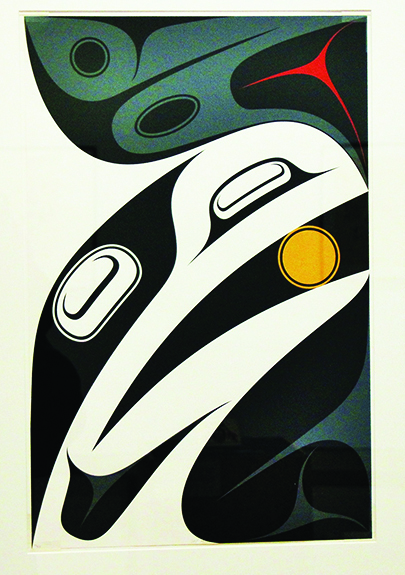 Washington’s Centennial exhibit of Native arts opened, managed by Patricia Cosgrove and Kenneth Watson. Both art historians were on a mission to convince Washingtonians that totem poles are not indigenous to this area and that Salish art is. The exhibit was incredibly successful, and soon many influences aligned to literally change the landscape of the Northwest Native art market. Ever since, the diligence and commitment of so many artists and their allies has led to the word ‘Salish’ entering mainstream vocabulary. This insured the characteristic sweeping lines and subtle patterns of Salish arts remains recognizable and emblematic of the greater Seattle area. Through the effort of many, this vision has come true. High quality galleries like Seattle’s Stonington Gallery and Steinbrueck Native Gallery feature experienced and rising artists from across the Salish Sea region. Generations of new artists have risen in skill and popularity. Today, Salish art is an explosion of innovation and creativity that still has a firm foundation in our region’s heritage. 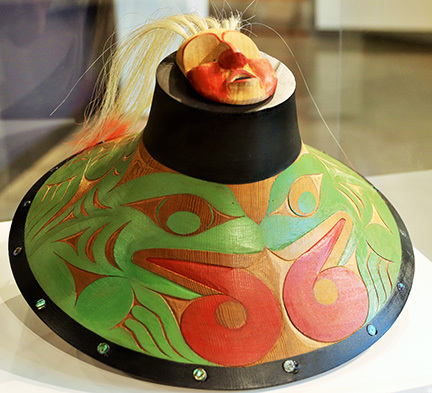 That innovation and creativity of Coast Salish artistry is currently on full display at the Mobius Art Gallery, located in Bothell on the Cascadia Community College campus. Inside the gallery mounts an unprecedented five-week long exhibition titled Native Spirit: Art from Indigenous Cultures. On Tuesday, October 9, the auditorium adjacent to Mobius Art Gallery was filled with excited art enthusiasts and college students who heard there would be a traditional Native American welcome ceremony to mark Native Spirit’s grand opening. 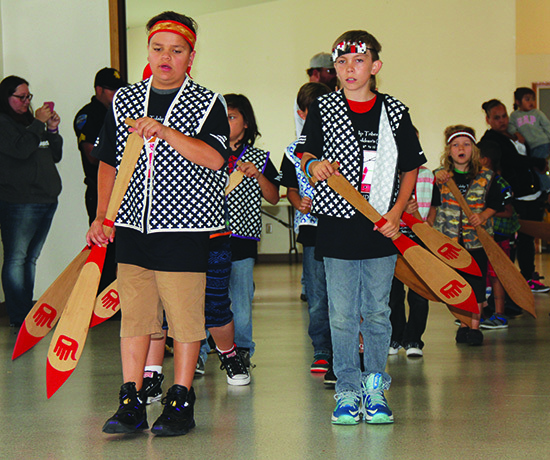 Led by Ray Fryberg, the Tulalip Canoe Family filled the auditorium with traditional song and dance to commemorate the special occasion. 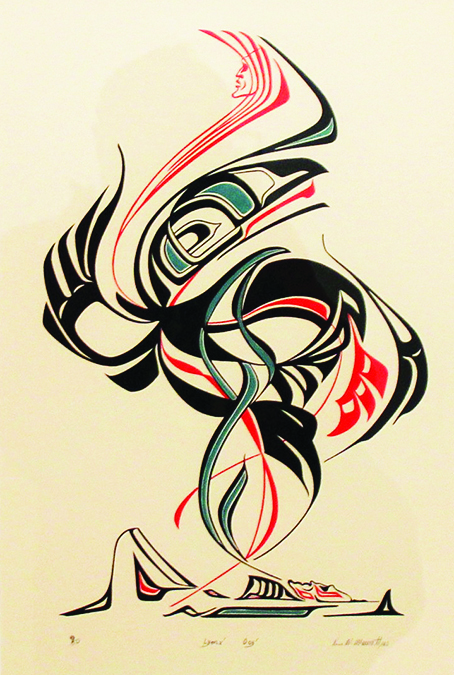 Eight artists were selected to be showcased in the Coast Salish themed exhibit, which includes handcrafted submissions by five talented Tulalip tribal members: Mike Gobin, Tillie Jones, Ty Juvinel, James Madison, and the artist known as Cedar. 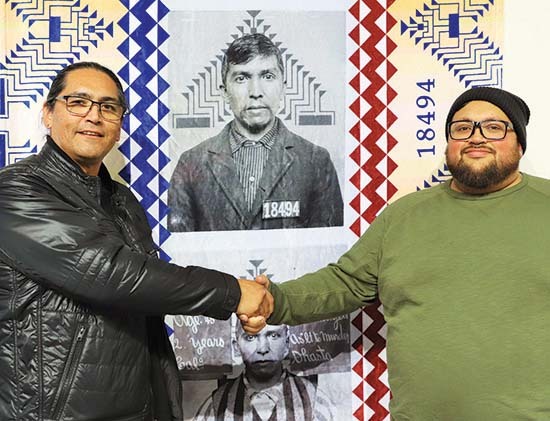 Lower Elwha artist Alfred Charles, Jr. and Tulalip artist Ty Juvinel. 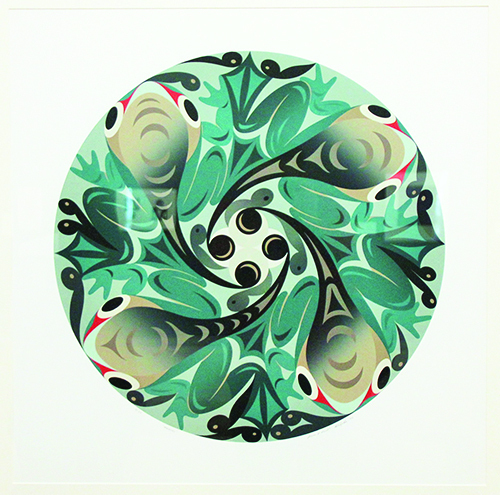 Coast Salish art is rich in its diversity of forms. 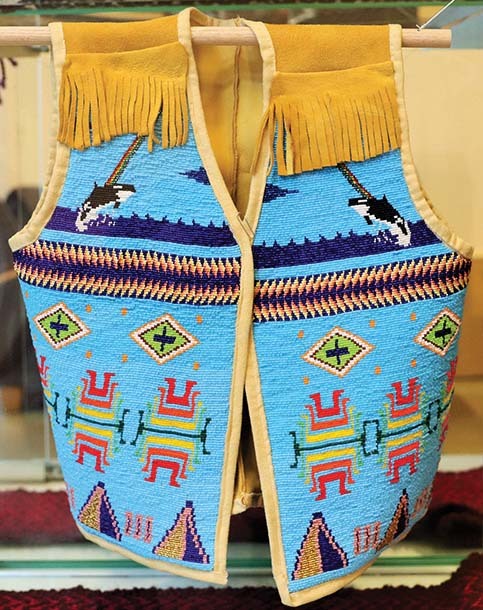 Masks, weavings, wood carvings, jewelry, and intricate bead work are but a few of the common mediums often associated with the Coast Salish style. Subject matter includes, but is not limited to, human and animal forms, spiritual themes and mythic figures. 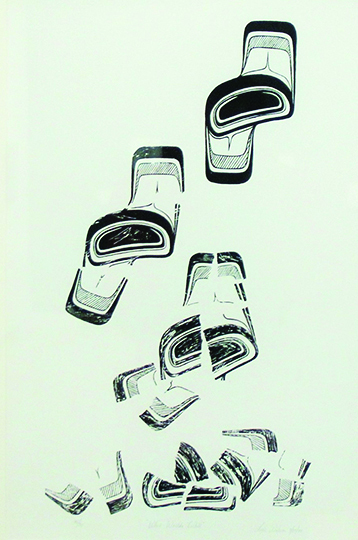 A diverse selection of artwork was chosen to be on display. 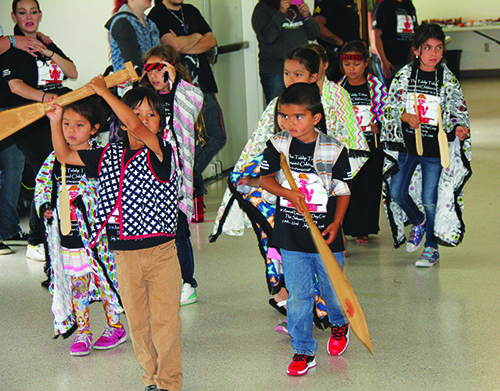 During week one of the 23rd Annual Lushootseed Day Camp, there were 58 youth participants. Engagement and overall involvement increased significantly during week two, as 72 Children of the Salmon contributed to the cultural sharing and commitment to Lushootseed. 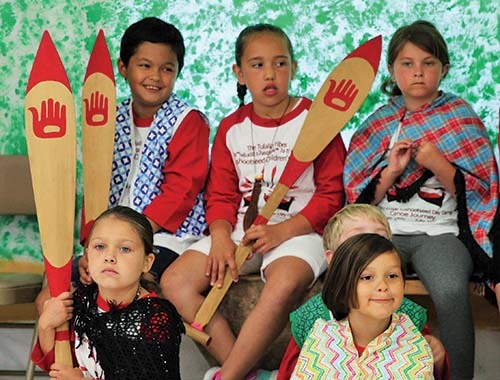 From Monday July 16 to Friday July 20, the Kenny Moses Building was home to the children learning traditional teachings, listening to storytelling by elders, and using their creative minds to create and paint an assortment of giveaway items. 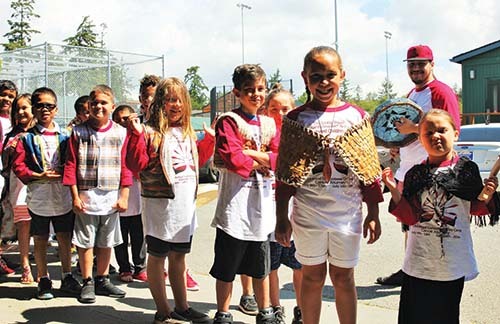 It’s a time that Tulalip children, families and community look forward to as it provides them an opportunity to immerse themselves in Lushootseed and the rich culture of the Coast Salish people. Open to children age five to twelve who want to learn about their culture and the language of their ancestors, Lushootseed Camp provides invaluable traditional teachings through art, songs, technology, weaving and storytelling. 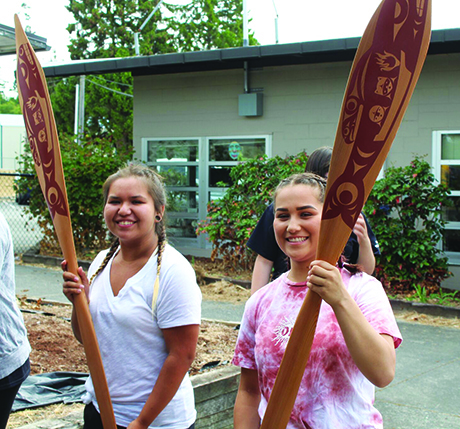 Each year the Lushootseed Department teams up with Cultural Resources, along with a select number of vital community volunteers, to hold two one-week day camps in the summer. With a high turnout in camp participation came an equally impressive turnout in community volunteers who assisted Lushootseed staff to coordinate daily camp activities. There were 15 volunteers readily available on a daily basis to help camp run smoothly. Art – Succulents, clam shell rattles, clam shell succulent holders. Weaving – God’s Eye, bracelets. Language – Lushootseed alphabet, canoe terms. 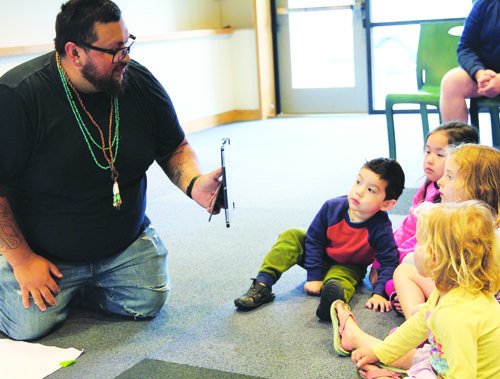 Technology – children learned and practiced Lushootseed materials related their final performance using handheld games on Tablets created by Dave Sienko. Every station and daily lesson incorporated various Canoe Journey teachings and protocol verbiage. 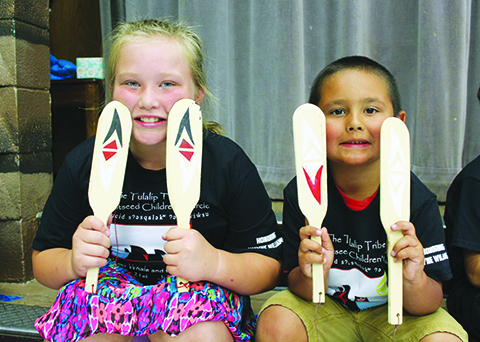 With the annual tribal Canoe Journey going on now, it made for an ideal time to teach the youngsters about the tradition. 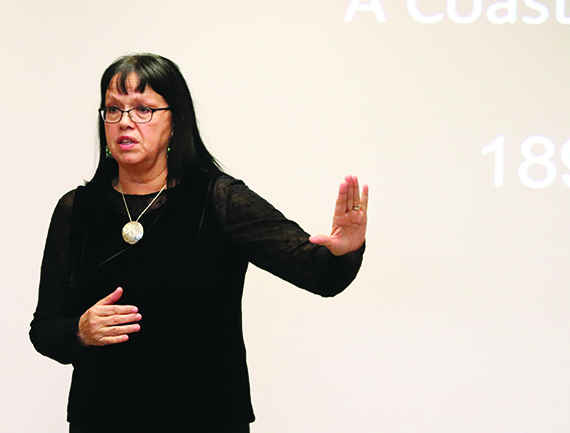 “We wanted to take this opportunity to give our young ones as much teachings as possible,” explained Language Warrior Roselle Fryberg. 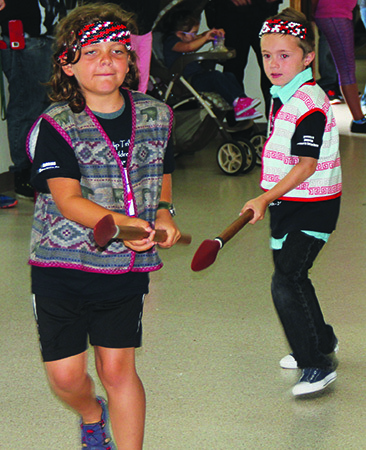 “It was really important to us to teach them about hosting a potlatch and coming together as a community. For our mini Canoe Journey, each child plays a role. We have fisherman, berry pickers, tribal leaders hosting Canoe Journey, and several canoes representing visiting tribes. “We also talked about how grateful we are that they are here to carry on these traditions of singing, dancing, and speaking their ancestral language. One day, all these teachings will be on their shoulders to carry on and pass to the next generation,” added Roselle. 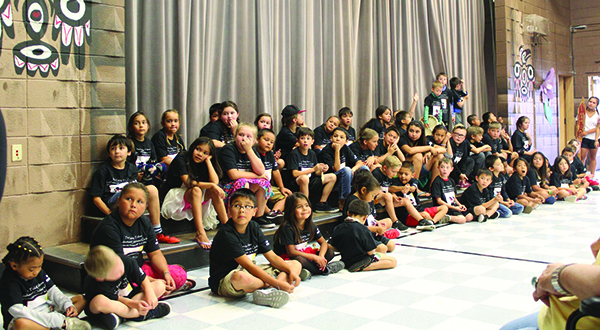 The closing ceremony for week two’s camp took place on Friday, July 20 at the Kenny Moses Building. The joyous, young play-performers made their theatrical debut to a large community attendance, as family and friends came out in droves to show their support. Most of the children beamed with joy as they performed their roles in the closing ceremony, while some caught the shy bug being in front of such a large audience. There were several Lushootseed songs everyone was able to sing along together, giving family and friends plenty of opportunities to capture such precious moments on photos or video. “We would like to thank the children for all of their hard work and efforts,” proclaimed Natosha Gobin during the play’s opening. “They attended camp for just one week and learned so much about their culture, traditions, language, and more. They do not hesitate to step up and share their teachings. After the youth performed their rendition of “Mini Canoe Journey” and the ceremonial witnesses had shared a few words, there was a giveaway. The camp participants gave their handmade crafts created during the past week to each and every audience member; sharing in a final act of memory making with their peers, before filling their bellies with a salmon lunch. For Native Americans, the telling of stories passed down from generation to generation remains a crucial form of knowledge transfer. Oral storytelling traditions allow tribes to communicate their spiritual and historical understandings of themselves and the world they cultivated for their children and their children’s children. This all but guarantees that members of each individual tribal nation never forget their roots or lose sight of important teachings that continue a harmonious and cooperative existence with nature. 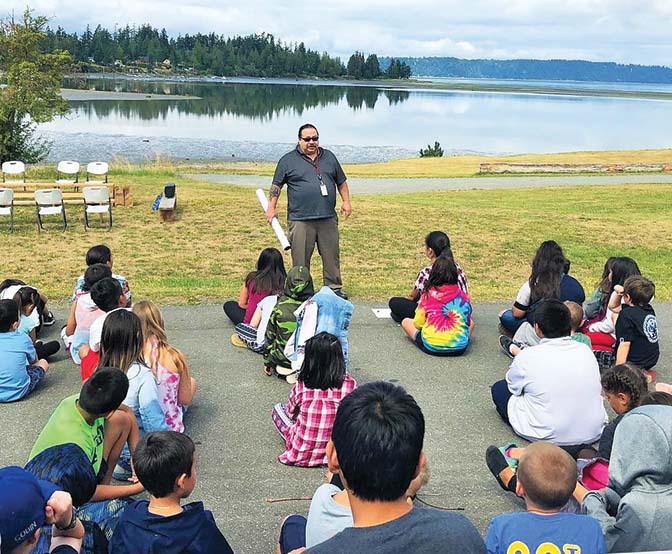 The tradition of storytelling lives on in Tulalip, where several prominent storytellers have been featured as part of a library-ran initiative to teach the general public about Native culture and to honor the Indigenous land on which they reside. 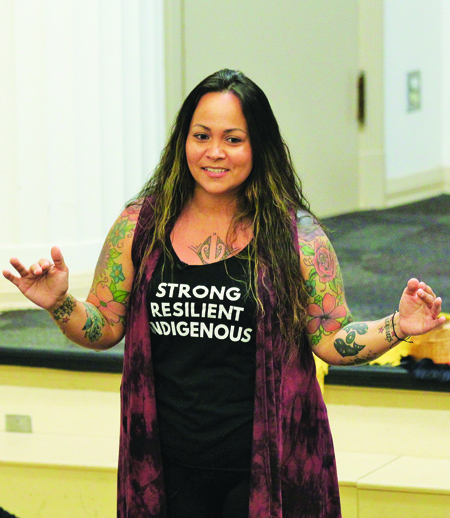 Culture bearers Michelle Myles, Natosha Gobin, and KT Jean Hots comprised a team of Tulalip storytellers who shared their craft at the Everett Public Library. 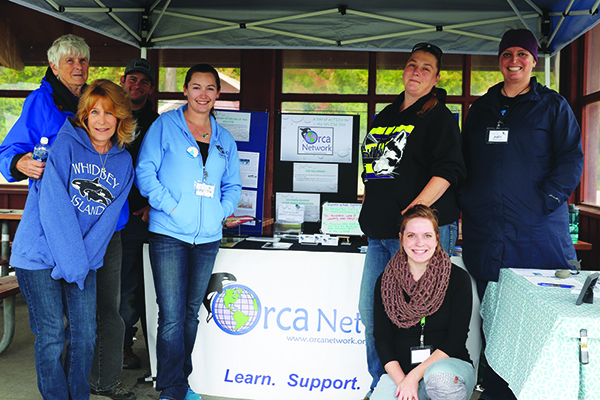 The event was part of the city of Everett’s 125th anniversary celebration. 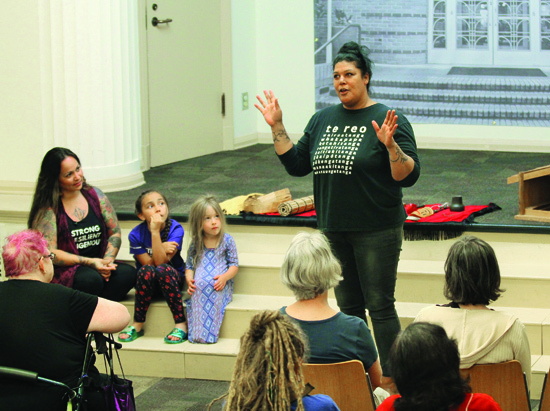 The library’s auditorium was filled to capacity with eager listeners willing to explore local history from the Tulalip Tribes’ perspective, while learning about a vibrant culture and community. 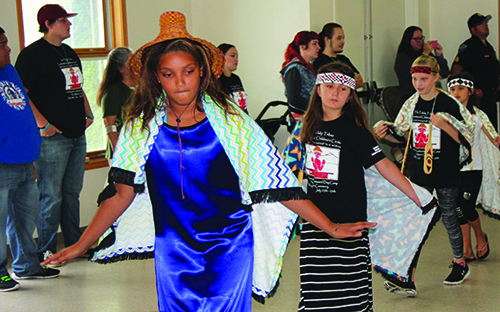 “We were invited to share traditional stories from our area and ancestors,” said Natosha Gobin, Lushootseed Teacher. “We shared oral history and helped the listeners gain a better understanding of the life ways of Coast Salish people. Natosha and Michelle took turns sharing traditional stories, such as The Seal Hunting Brothers, The Gossiping Clams, The Basket Lady, and A Story About Coyote. In each story were lessons learned about living in a good way, instructional survival skills, and even explanations for natural phenomena. At one point, storyteller apprentice, nine-year-old tribal member KT took center stage and shared the story Her First Basket. After finishing her favorite story, KT received a loud applause from the audience. Nine-year-old storyteller, KT Jean Hots. Native American storytelling has always been and continues to be equal parts real, metaphorical, spiritual, instructional and transformational. Most of all, however, the stories are entertaining and memorable to the audiences who hear them. This way the stories are remembered and passed down to the coming generations, who needs to understand who they are, where they come from, and why the world is the way it is. Ty has recently partnered with the Seattle Public Library system and will be sharing Coast Salish stories and tradition through the summer. Intended for kids ages 7-11, there is no registration required for families to bring their kids to a Ty story time. Using modern technology, Ty has fully illustrated and digitized several of his stories for use on an iPad. Of note, the University of Washington has purchased his digital stories to be used in their travelling exhibits and Burke Mobile for educating people on Coast Salish culture. 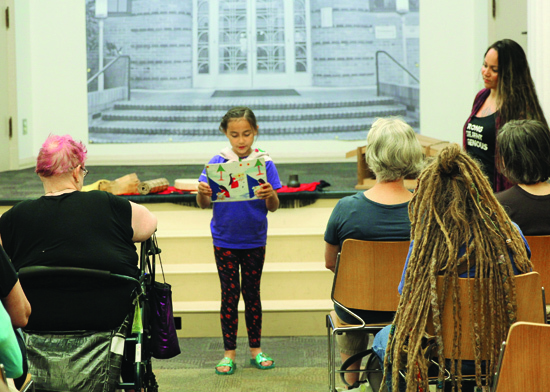 Seattle’s Broadview Branch was the latest to host the storytelling series. Children were treated to several original stories, including How Mouse Moved the Mountain, When Beaver Taught Man, and How Puppy Got His Ears. Although the tradition of storytelling is less common today than it was many years ago, the rich oral tradition lives on through the current generation of culture bearers. 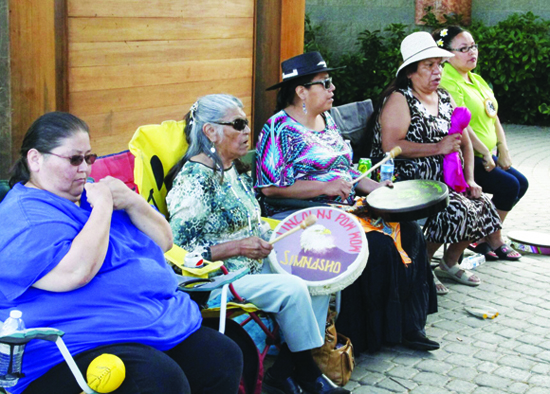 Players of the traditional Coast Salish gambling game, known by a few names including slahal, lahal, bone games and stick games, gathered at the Tulalip Amphitheater during the weekend of June 1-3. 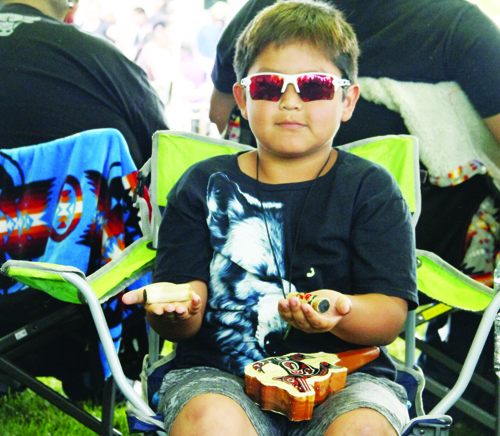 Many players arrived an entire day early, equipped with their bones, drums and lawn chairs in anticipation of the 9th Annual Tulalip Tribes Stick Game Tournament. This year’s tournament attracted a record-breaking one-hundred and forty-two teams who competed for a chance to win cash prizes, including the grand prize of $50,000. 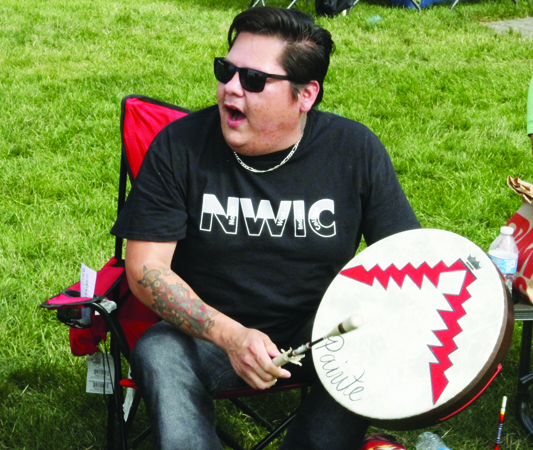 Native families journeyed across Washington and Canada to play in the tournament. The total payout this year was $63,000 which was distributed throughout the weekend during a number of rounds including the kid’s tournament, which drew a large crowd of spectators. The game was said to be invented centuries ago in order to settle a number of disputes between tribes of the Northwest, including the rights to fishing, gathering and hunting territories. As legend has it, the game was gifted to the people by the animals in order to unite the tribes and prevent war. During gameplay, two teams consisting of three to five players face each other. The game pieces, which include a set of bones and sticks, are discreetly distributed amongst the players on one team. The opposing team has to correctly guess where the bones are and how many pieces the player has in their hands. The sticks are used to keep score and the team with their bones in play, sing traditional family songs in an attempt to distract the other team from seeing where the bones end up. The team who has the correct amount of guesses wins the game and gets to advance to the next round. 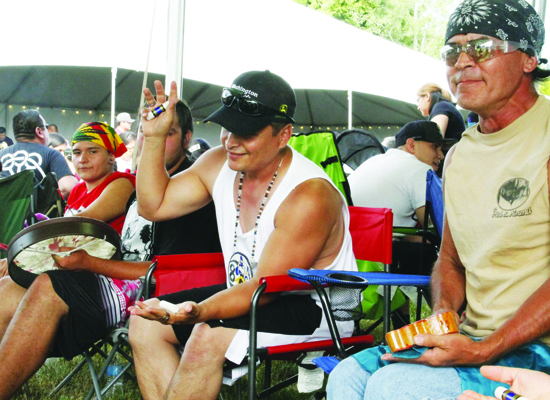 Smiles are shared throughout the entire weekend, even when a team is knocked out of the competition, as most people are delighted to visit with other Native people and practice the traditional game of our ancestors. 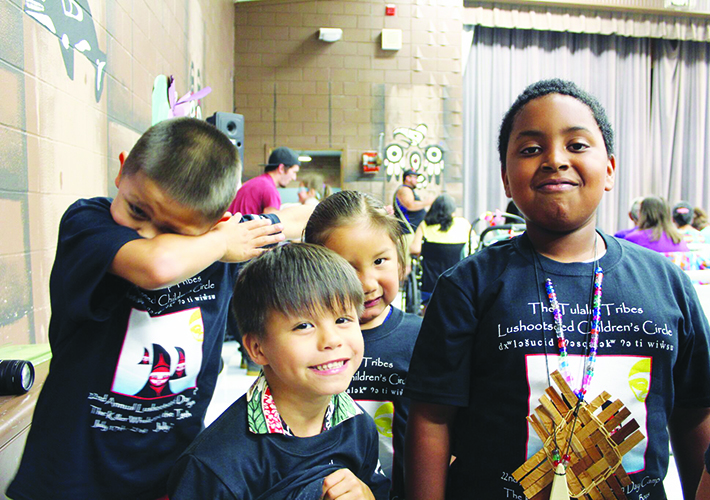 During the pleasantly warm and sunny summer days of July 18-22, the old Tulalip Elementary gymnasium was home to the 21st Annual Lushootseed Day Camp. 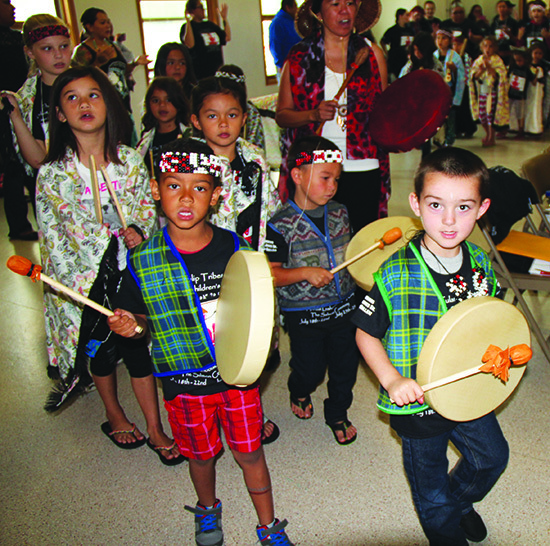 The camp was open to children age five to twelve who wanted to learn about their culture and Lushootseed language through art, songs, games, weaving and storytelling. 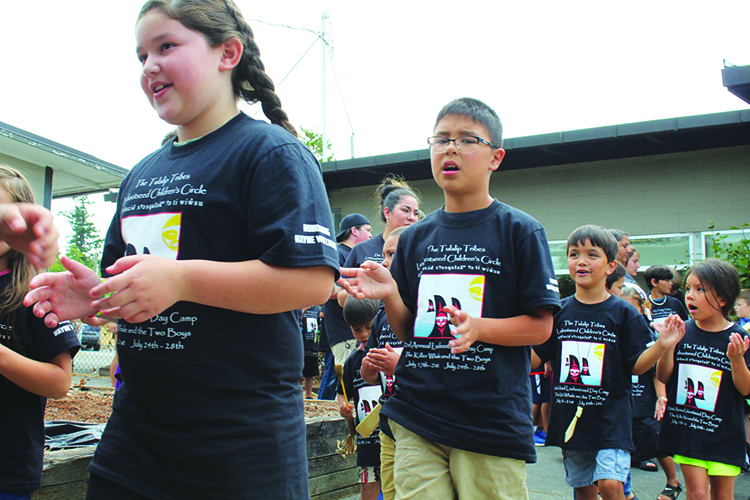 Each year the Lushootseed Department teams up with the Cultural Resources Department, along with a select number of very vital community volunteers, to hold two one-week camps. 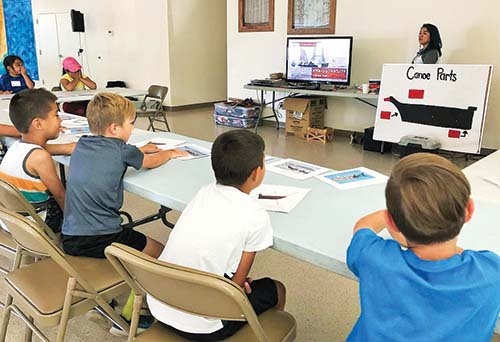 Each camp has openings for up to 50 participants, but this year the demand was so high that 64 kids were signed up and participated in Language Camp week 1. 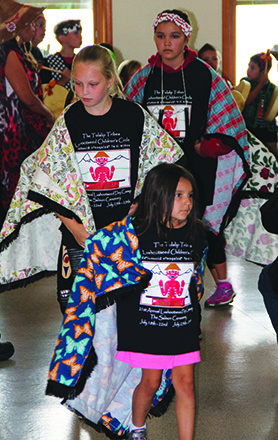 Using the 1979 Salmon Ceremony video to help pass on the earliest teaching of what is still practiced today, the young campers learned a selection of highlighted songs and dances. 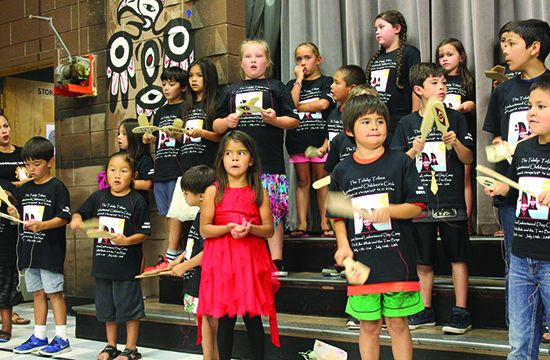 The lessons learned each day during Language Camp were based on the teachings of the Salmon Ceremony by way of songs and dances, traditional teachings, language, art, weaving, and technology. The goal this year was to provide our youth with some basic regalia along with the knowledge and ability to sing and dance. Staffers hope the youth that have participated have the teachings and experience needed so they will stand up and sing at every opportunity. 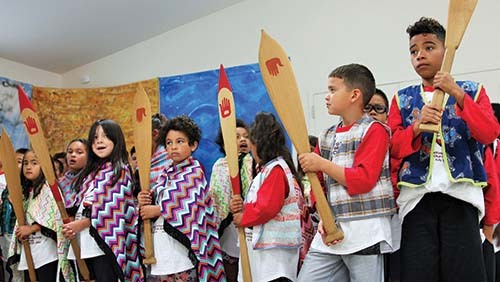 With the emphasis of honoring the past and impacting the future with education and practice of Salmon Ceremony, there was a renewed sense of excitement and vigor to both the teachers and bright, young minds who participated. 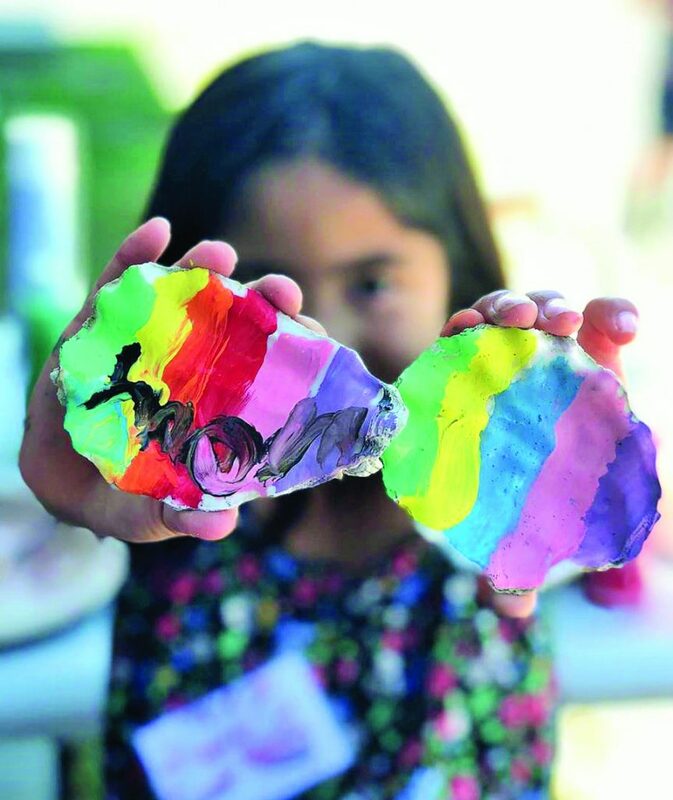 There was so much to do and prepare for that the parents of each camper were also called upon to participate in create long-lasting memories while working with their kids and fellow community members to help make regalia. During the evening of Tuesday, July 19 the parents came through in a big way. The parents and guardians joined their kids in the gymnasium and were guided on how to make the drums and clappers. There were lots of laughs and stories shared as the evening went on and slowly, but surely every camper was assured of hand-made regalia. Art – Salmon bracelets, Salmon hands, paddle necklaces. Weaving – Pony Bead loom beading, small raffia baskets. 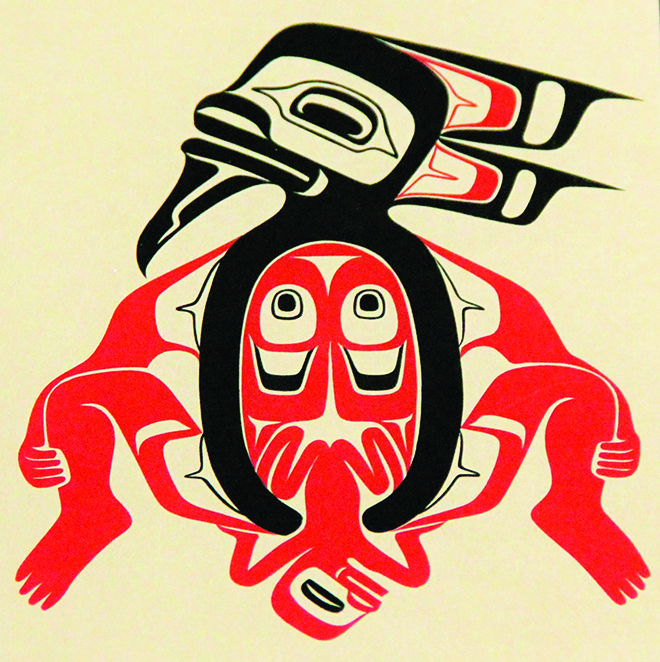 Songs and Dances – Welcome Song, Eagle Owl BlueJay Song, Snohomish Warrior Song. 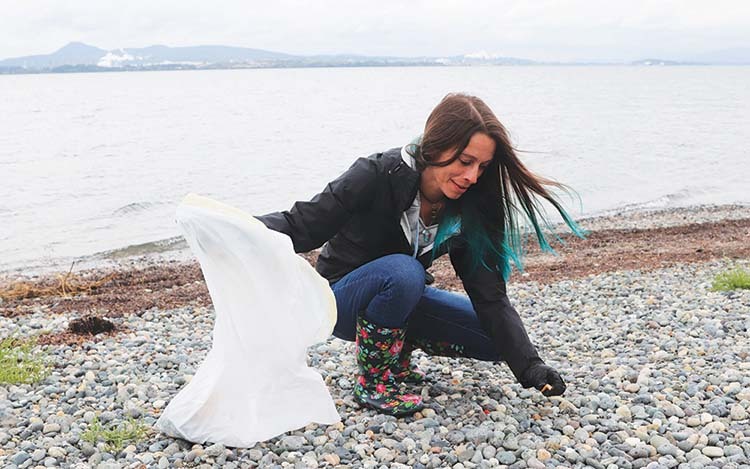 Traditional Teachings – Salmon Ceremony videos, traditional stories, realia experience in traditional story and science face of how Salmon migrate. Games – Various games and playground time. Language – letter sounds, Salmon Ceremony key words, Lushootseed workbook. Technology – children learned and practiced Lushootseed materials related to Salmon Ceremony using the Nintendo DSi handheld games created by Dave Sienko. 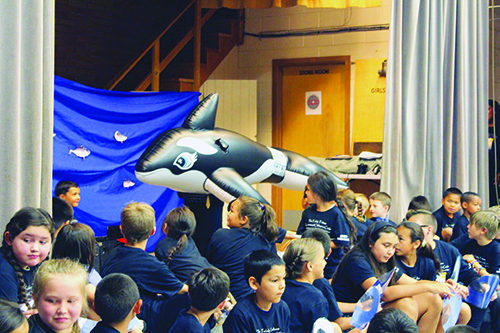 The closing ceremony for week one’s camp was held on Friday, July 22 in the Kenny Moses Building. 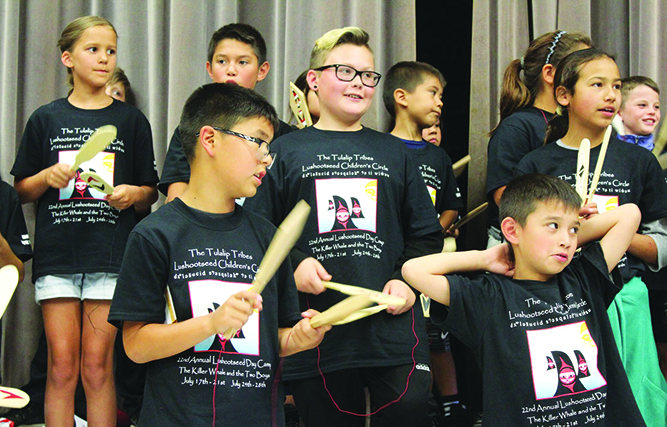 The joyous, young play-performers made their debut to a large community attendance, as family and friends came out in droves to show their support. “The young ones continue to honor our ancestors by learning their songs and words. It fills my heart with so much joy to watch them speak our language and perform the dances of Salmon Ceremony,” marveled ceremonial witness Denise Sheldon. After the youth performed their rendition of Salmon Ceremony and the ceremonial witnesses had shared a few words, there was a giveaway. The camp participants gave handmade crafts to the audience members, which preceded a salmon lunch that everyone thoroughly enjoyed. The “7th generation” principle imbedded in Native culture says that in every decision, be it personal, governmental or corporate, we must consider how it will affect our descendants seven generations into the future. Long before environmentalists got us thinking about “carbon footprints” and “sustainability”, indigenous peoples lived in balance with the world around them. But then hundreds of years of colonization happened that nearly drove our population to extinction. Yet, still we remain. Then came the decades and decades of federal policy aimed at forced assimilation for the remaining Native population who were confined to reservations. Policy after policy required children to be removed from their homes and communities, and enrolled in boarding schools where many were punished or beaten for speaking their Native languages. As a result, generations of Native people either never learned their language or lost their fluency in it. Thus, many links to traditional culture and knowledge were broken. Still we remain. From the ashes of the colonial fire that ravished our people, we endured even though much was lost. The language of our region, Lushootseed, once spoken by thousands of Coast Salish people in Washington State clings to life by the small number of people dedicated to preserving it. Lushootseed’s territory extends from north of present-day Mount Vernon to south of Olympia. 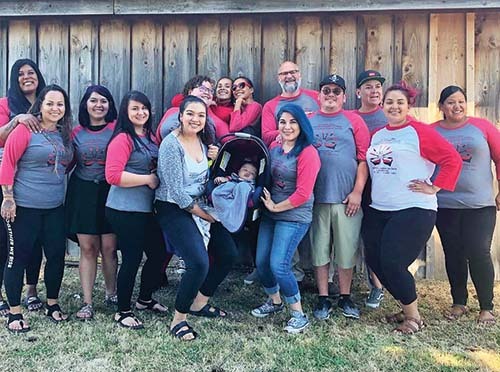 Recent decades have seen a cultural resurgence in Puget Sound tribal communities, including carving, weaving, canoe making, and efforts to revitalize Lushootseed. New tribal museums and long houses have been constructed, and events such as the annual Canoe Journey involve hundreds of participants and thousands of spectators. Today, on the Tulalip reservation, few elders remain who learned Lushootseed as a first language. 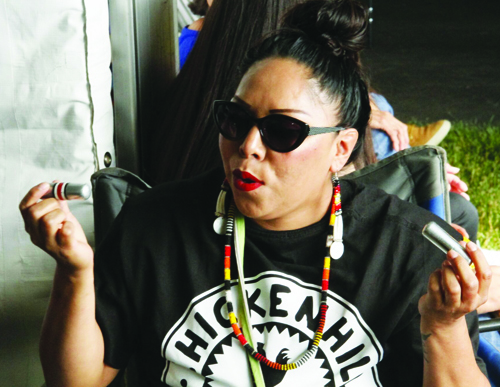 In fact, Lushootseed Department Manager Michelle Balagot says there may be only 30-40 tribal members who can speak Lushootseed with some degree of conversational skill. She adds that although that number is incredibly low, the department is working hard to make sure that the language survives, and the next few years will be critical if the language is to be revitalized to the point that children become and remain fluent speakers. 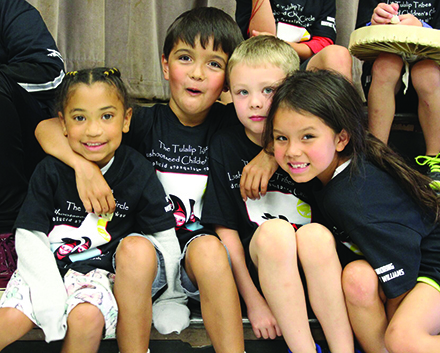 The biggest advancement in preserving and revitalizing Lushootseed amongst Tulalip tribal members has been building an essential staff of Lushootseed teachers whose love for their language and culture can easily permeate through the young minds and spirits of our most precious resource, our children. 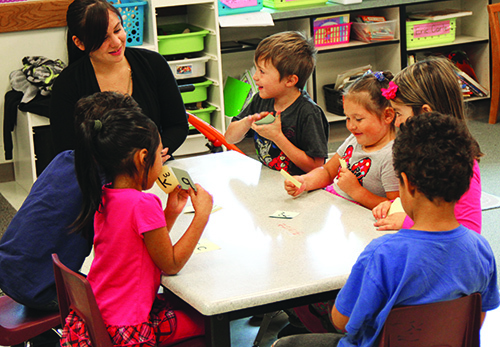 This past school year the Lushootseed Department had full access to teach our ancestral language to the kindergarten classes and one 1st grade class at Quil Ceda Tulalip Elementary School. 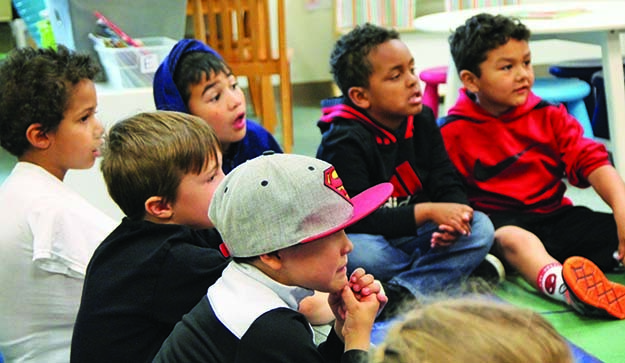 It was the return back to a curriculum that had been paused in 2011 when the old Tulalip Elementary was closed. 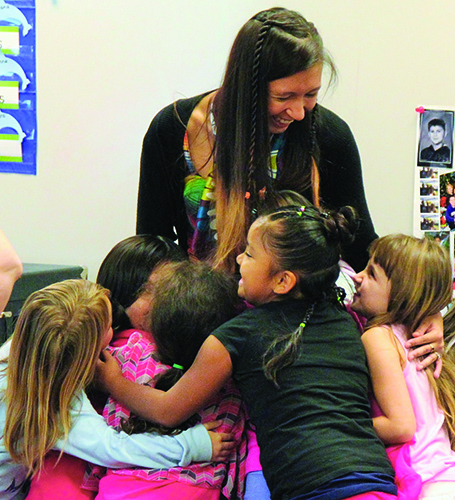 Lushootseed language teachers Maria Martin and Nikki St. Onge, known respectfully as Miss Maria and Ms. Nikki to their students, were selected to initiate the language revival at the elementary. They taught three classes individually and one “immersion” class jointly, for a grand total of seven classes. 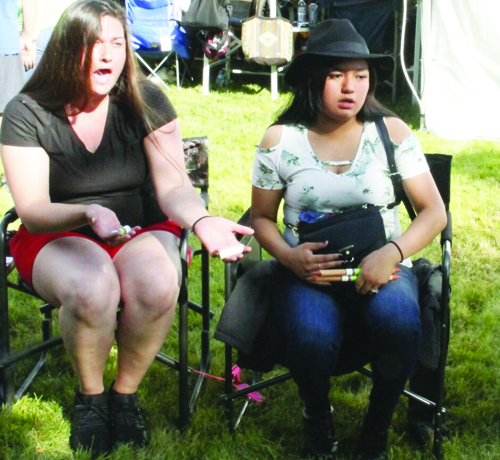 For Miss Maria and Ms. Nikki, it was an opportunity to perpetuate the many Lushootseed stories and phrases they learned as children, and build upon the legacy of those who came before them. “I really enjoyed teaching at Tulalip Quil Ceda. I am very grateful to have the opportunity to work with some of my students, since they were babies when I worked at the child care center in 2011. 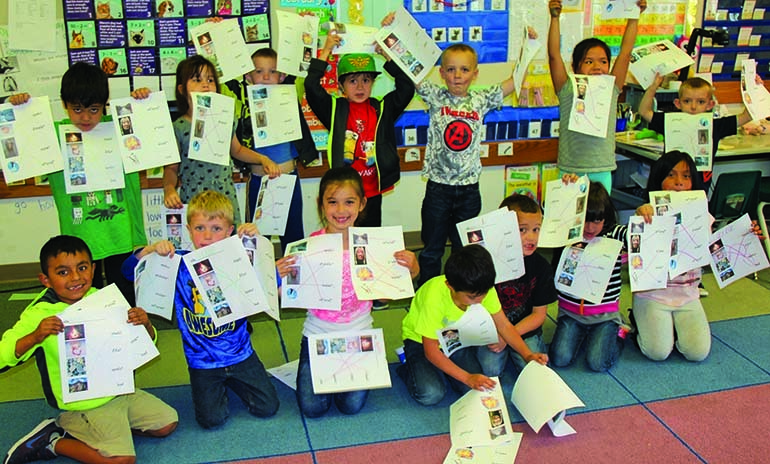 Then again at Montessori when I first started in the Lushootseed department in 2012, and now moving up with them to kindergarten,” marvels Ms. Nikki. “Not a lot of people get the opportunity to have this experience. It’s really rewarding to watch them grow and develop their own personalities and characteristics, and also teach them such an important part of our culture. 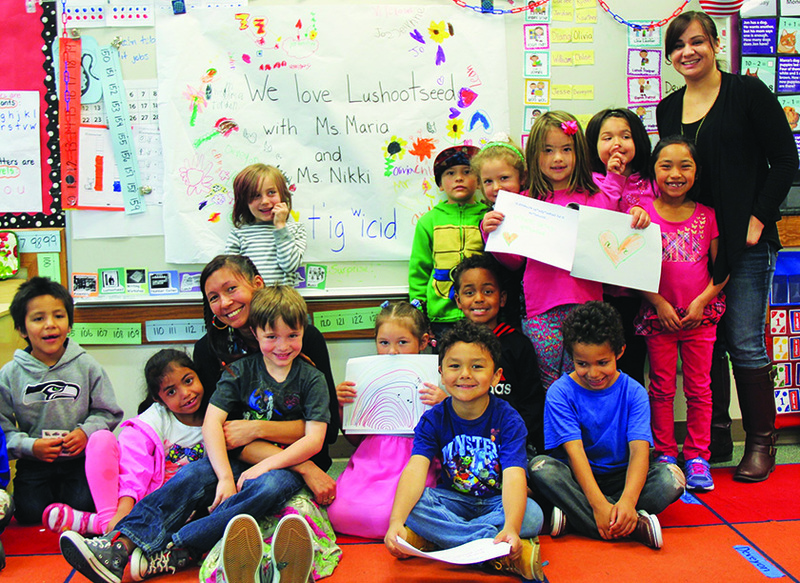 Both Miss Maria and Ms. Nikki having taught Lushootseed at the Tulalip Montessori meant a strong familiarity and trust with their Tulalip students in their kindergarten classes at the elementary. All of their former students remembered them and were very excited to have them as Lushootseed teachers again. The excitement was shared by both teachers as they were able to create their own curriculum and teaching plans for students they knew very well. They knew what teaching methods would work and wouldn’t work with their students already. Throughout the school year the students learned to play games, some of their favorites being təs-təs (matching game), ɬiʔɬdahəb (fishing), stab kʷi ʔəsx̌ʷil̕ (what’s missing? ), xʷiʔ gʷadsx̌ək̓ʷud (don’t turn over), ʔuc̓əlalikʷ čəd (I win/bingo), go fish, and tic-tac-know. Students completed daily work sheets that taught them how to read and write in Lushootseed while reinforcing many of the vocabulary words they learned at Montessori and the new Early Learning Academy. Some of their favorite songs they learned are: ʔi čəxʷ syaʔyaʔ (hello friend), kʷədačiʔb čəɬ syaʔyaʔ (ring around the rosy), huyʔ syaʔyaʔ (good bye friend), ʔə tə tib, ʔulub miʔman pišpišpiš (ten little kittens), šəqild st̕ilib (respect song), sʔacus sʔilalubid (head, shoulders), baqʷuʔ stubs (Frosty the Snowman), and waq̓waq̓ st̕ilib (frog song). The students were able to hear stories that were translated into Lushootseed and traditional stories such as “tsiʔəʔ bəšč̓ad” (Lady Louse), “tsi sxʷəyuq̓ʷ” (The Basket Lady), and “Clamming with Lizzie.” They learned to count up to 25 and were exposed to 30 and 40. They have also learned verbs, farm animals, woodland animals, body parts, clothing and so much more. 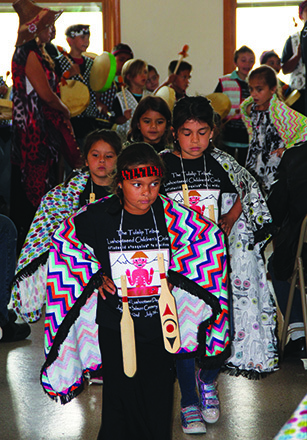 As the year progressed and the Lushootseed curriculum continued to evolve, so did the students. They developed such a good working knowledge with certain phrases and words that it became common place to hear the young students speaking Lushootseed even when Miss Maria and Ms. Nikki weren’t around. The teachers are even hearing numerous stories about their students using Lushootseed at home with their parents. 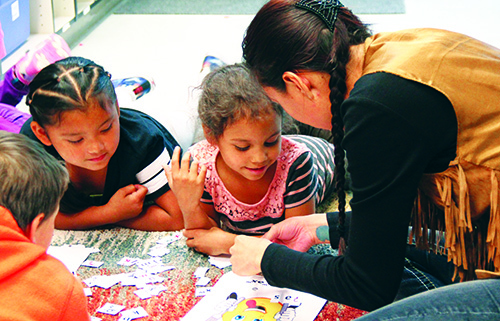 Being able to demonstrate what you’ve learned is the basis of knowledge, and the young students using Lushootseed when the teachers aren’t around is proof positive the internal flame to connect with our culture and ancestors through language is being rekindled. It’s all part of an essential process to carry on our ancestors’ legacy by keeping the language alive. Because seven generations from now, we want Lushootseed to be the common language of all Tulalip people, like it was for our ancestors.